On 28th June 2009 Portsmouth hosted the Ghost Ship Pageant. 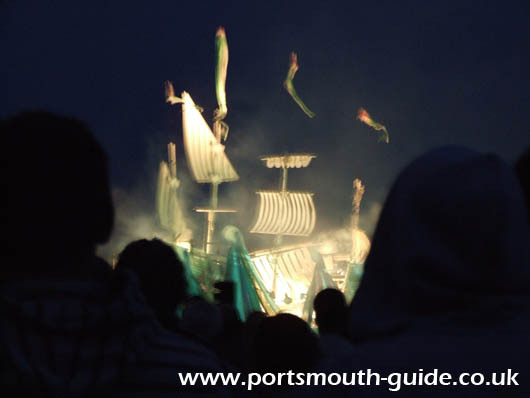 The pageant was created to celebrate Henry VIII's birthday by "Walk the Plank" for Portsmouth Festivities. The event was also designed to mark the 500th anniversary of the building of the Mary Rose. The day started at Portsmouth Historic Dockyard with Falconry and Tudor cooking taking place. There were also costumed re-enactors enabling people to meet Henry VIII and his court. At 3:30 a procession started at Portsmouth Historic Dockyard involving sailors, shipwrights, flag bearers and musicians. The procession made its way along the streets of Portsmouth from the dockyard to Southsea Bandstand. Around Southsea Bandstand there were many food stalls and living history displays to be enjoyed. In the evening the Ghost Ship Spectacle took place on Castle Field. This was a truly magical event with a cast of hundreds. It also featured a burning anchor, splendid lighting effects, pyrotechnics and fire. The evening culminated with a firework display. Crowds turned up to watch the events and they proved a huge success. The figure of the Mary Rose appeared on the field as carefully constructed wooden pallets burned. As dusk fell the Ghost Ship show came to life with narration telling the story of Henry VIII and the Mary Rose. The show culminated with a firework display and burning of the ship. For more details about the Mary Rose please click here or for more information about the 2010 Portsmouth Festivities please click here.